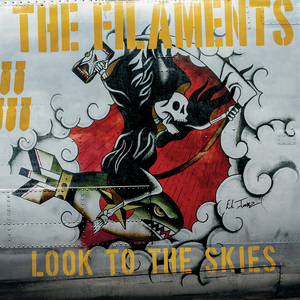 The Filament's debut album 'Skull and Trombones' was released in 2001 on New Blood Records and tours with The Casualties, Deadline and Roger Miret and The Disasters followed this release. The Filaments gained a reputation for their immense live shows in the UK, and on the European mainland. This record was accompanied by a split 7 inch single with Deadline entitled "Punk Unity." Their second album ‘..Whats Next?’ was released in 2004 on Household Name Records. This time the band showed a greater depth in song writing; UK '82 style punk was mixed with a wide range of influences including Dub, 2-tone influenced ska and Psychobilly. 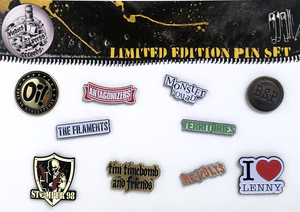 Following this release The Filaments went on to tour alongside popular U.S acts such as The Horrorpops and Leftover Crack, as well as playing festivals including Glastonbury, Wasted / Rebellion (Blackpool), Rude Boys Unity (Geneva) and Punk 'n' Disorderly (Berlin). A split E.P with Beans, Bodybag and BBK followed, as well as a split 7 inch with The Stockyard Stoics. The Filaments performed a live session from BBC's Maida Vale Studios for Mike Davies' Radio 1 punk show in 2005 after 'What's Next' spent a month sitting at the top of the programmes Outlaw Anthems chart. In 2005, lead vocalist Jon Fawkes emigrated to America and The Filaments subsequently disbanded. On the 10th July 2005 they played their farewell show at the City Invasion tour at The Astoria, London. In March 2006 The Filaments played two sold out reunion shows at The Relentless Garage in Highbury, London with punk band Deadline and the Rebellion punk festival in Blackpool Winter gardens August 2007. In August 2009 they reformed to support Suicide Bid at The Relentless Garage, Highbury London. Jon had moved back to the UK permanently at this time and later The Filaments officially announced they had reformed. Their newest album, "Look To The Skies," is out now!